Daniel M. “Dan” Jenks, 68, of Topeka, passed away Friday, November 2, 2018. He was born February 8, 1950 in Topeka, the son of Lester Martin and Erma Irene (Redenbaugh) Jenks. He was a 1969 graduate of Silver Lake High School and served in the Kansas Army National Guard for over 20 years of service. 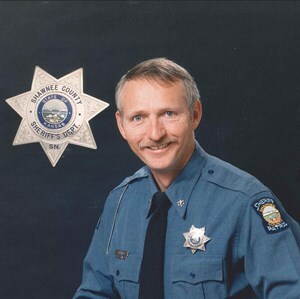 Daniel was employed by the Topeka Police Department and Shawnee County Sherriff Department, retiring in 2005 after 28 years of service. He was a member of the F.O.P. and American Legion Post 421. Daniel married Allis Elizabeth Sanford on February 12, 1994 in Topeka, KS. She survives. Other survivors include a daughter, Leslie Jenks Patterson; grandchildren, Bret, Ashley and Chelsea; great-grandsons, Anthony, Simon and Jayden; 6 sisters and 1 brother. He was preceded in death by his parents; and 9 siblings. Daniel enjoyed hunting, fishing, horses and riding his Harley. Honoring Daniel’s request, cremation is planned. A Celebration of Life will be held at a later date. Memorial contributions may be made to the Hope and Healing Academy. To leave a special message for the family online, click the Share Memories button above. Please also sign me up for Dove's email newsletter. Add your memories to the guest book of Daniel Jenks. Great man. Great stories. Glad he was able to enjoy some good trips on his MC. Always enjoyed seeing him. Always seemed to be smiling and always positive - even while fighting for his health. My memories with Dan don't go back many years. I met Dan in 2010 through our mutual friend/brother John Cipolla. When I first met Dan it was like I knew him all of my life. He was the kind of person that would literally give you the shirt off of his back and would do anything to make any friend or family member comfortable. After many years of hunting together in various places, the one thing I knew is that I would do anything for Dan. Our relationship grew over the short amount of time and he became like an older brother that would share his life experiences with me. He would share his time as an officer and all of the stories that came with that. His friendship meant so much to me, especially after just losing my father in 2010. John and I loved spending time together during the hunting season, but didn't get a chance to do much outside of that due to Dan's poor health. Even though hunting was the reason we came together, it wasn't the best part of the time we spent together. Even if we spent all day and didn't get to fire a shot it didn't matter, because I got to spend time with John & Dan. I had planned with John to come up to Topeka to see Dan and spend some time with him. Then I got the call from John to let me know that Dan had passed the night before. It has been hard thinking about the time I missed so that I could say good bye. Dan knew what he meant to me and what his friendship meant to me. I will miss Dan so much, but his memory will always be with me. I would like to send my heartfelt condolences to Dan's family and especially Alice who has been by Dan's side through all of health battles. Thank you for all you did for Dan. Dan was one of my first training officers when I joined the Shawnee County Sheriff's Department. He was instrumental instilling in me officer safety awareness and understanding the mindset of being a LEO. I am proud to be considered his friend. I will always be grateful for his support and guidance. Rest in peace. Condolences to Dan's family on his passing. Appreciation to his service to Country and Community. Remembering the times I played softball and fished with Dan. He will truly be missed. Dan was a great guy. I enjoyed spending time with him when I was in the T.P.D. Cadets and he was an advisor. He helped inspire my 30 year law enforcement career and I appreciate all he did and said. Rest in peace Dan. Dan was one of my favorite students at Silver Lake. I taught English there for three years and was glad to have him in my class. What a pleasant teen he was! Dan the world has lost a good man. Dan you were one of the kindest souls I know. You were always concerned about how everyone else was doing, never a concern for yourself! You were the reason I became a police officer. After seeing you and Saint on the streets I knew it was exactly what I wanted to do, only you were the best and you were my idol! Guard the gates with Saint until I see you again! Godspeed Sir! Always in our hearts and never forgotten! We are so sorry to hear of Dan's passing. Our thoughts and prayers are with all of you at this time. I was in the National Guard with your husband, father and grandfather. He was a Patriot. On this Veterans Day, 2018 I celebrate his life. He was a hero all in aspects of his life. Even though I moved from Topeka many years ago, I still thought of Dan many times. I am proud that I was in the National Guard with Dan. He will be missed by many. May God bless Dan and his loved ones. Dan was a good friend, and I will really miss him. When I was first hired I had to work in the old jail for 16 months. We always had problems with the inmates, and Dan was with the TPD at that time and he had a beautiful white dog. We would call, he would come over and the dog would chew up a few inmates and the trouble would stop. I loved that dog. We kept up with the latest news at the various Sheriff Office functions and on FB. We always talked about his wife as she is a good friend of mine, and he really loved her. When I worked in the courthouse I stopped to visit her daily. Dan was a true friend whom I could count on no matter what. He was a great guy. I will really miss him. Prayers and sympathy to his friends and family. Thank you to Dan's family who shared him with us while he served with the Shawnee County Sheriff's Office for the many years. To Dan, thank you for your service to the men and women of the Shawnee County Sheriff's Office. Rest In Peace! Uncle Dan was kind & loving, I always thought of him as a hero (police officer). He took the time to come by & visit me often, even through marriage & divorce giving me calm advice. He took me on motorcycle rides and I gave him hair cuts. I am extremely sad & will miss him so very much. He was funny & blunt and extremely honest. One weekend when I was still living at home & I was in Middle school, he was invited out to my parents house & mom was so proud of her baking for the day. When she directly asked Uncle Dan what he thought of the cake, he drew a deep breath & said: "Well.... I've had better. It's a little dry". You could have heard a pin drop & then my dad busted out laughing & the whole room was a party. He was loved by everyone & left kindness wherever he went. He was so kind to me I'll never forget it. Thank you for all you did for me, & God Bless you. You are finally home. So sorry to hear of Dan’s passing. Our thoughts and prayers are with you and family at this time. So many wonderful memories of him and you from the Courthouse days. His jokes and smile I’ll miss most...You were truly the Love of his life, he always said so. I have memories of a kind, friendly, gentle soul. My prayers and condolences to the family. Uncle Dan you have been a part of my life for as long as I can remember. You have been there for guidance and support. Some of the most important and beneficial advice I have gotten has been from you. You have always been honest and told me what I needed to hear even if it isn't what I wanted to hear. Thanks for being one of the really great men in my life. My father William Lewis and I served with Dan in the Army and I went on to work around and with Dan at the Sheriff’s Office until his retirement. Rest In Peace brother, see you in roll call. Dan you always had a smile on your face and ornery as all get out. You will be missed by many. RIP may God comfort your family. To the Family of Sherriff Officer Daniel Jenks. It is with utmost sympathy of your Loss. Jenksy as we in LEO called him was a Great Officer and will be Greatly missed. God Bless you all. Many condolences. I have heard many Uncle Dan stories. He will greatly be missed by my family. So many memories from childhood to present. No matter what my issue, I always felt I could contact Uncle "D" and he had my solution. He was like another big brother to me growing up as well as in later life as an adult. He assisted me in a 2 year divorce back in the 90's and became my law consultant. He was my friend and at times my confidant because he let you know he cared. He supported us by coming to Chris' live band events and was the glue for family issues. No matter when we talked or got together he had to tell you how proud he was of his grand kids...the proudest Popo. He will be so missed by so many. Sending all my love and hugs to all those who love him. Forever in our hearts!! Dan Thank You for being a mentor and you and Saint trained me and Thor. We had a blast fishing and hunting and hanging out on some weekends. We also served together in Ks Natl Guard Memories I’ll never forget. Love ya Man! Time to rest now. Uncle Dan we will miss you ! You were a funny person with a great laugh ! Always willing to lend a hand and never selfish with your time. Our love and prayers go out to Leslie and her children . If you need an arrangement delivered in less than two (2) hours, please call (800) 707-7361.